Who and where were the Avari? Here's a Sunday discussion. Feel free to add your own comments, especially those who could not make it to the meeting. That was a very interesting discussion! I'm summarizing both what is in the meeting transcript and what I remember for ease of reference. The elves awakened at Cuivienen as three kindreds, named Minyar (First), Tatyar (Second), and Lenyar (Third). Of these, the Minyar, later to become the Vanyar, was the smallest, and the Lenyar, later to become the Teleri, was the largest, and the Tatyar (later Noldor) was larger than the Minyar but considerably smaller than the Lenyar. When Orome delivered the invitation of the Valar to the Quendi, those who decided to leave were known as the Eldar, and those who remained at that time were known as the Avari (refusers). Anyone who left at Orome's summons was an Elda, even if the journey was later aborted. I have seen few references in Tolkien to the Avari, but all suggest that they were nomadic "wanderers" and generally lived far to the east. My guess is that they had occasional contact with the wood elves of Mirkwood and probably traded with Dale and Esgaroth to some degree. To what degree they developed social structures is as far as I know entirely unknown. Of the Eldar, the three kindreds were later named Vanyar ("fair folk"), Noldor ("deep folk"), and Teleri ("laggards"). All the Vanyar were of the Eldar, and as I remember, nearly all the Noldor. The great majority of the Avari came from the Third kindred, though a great many also left, later to become the Teleri. All of the Vanyar and Noldor made it to Valinor. The Teleri split on the way. The first split was that of the Nandor, who first went south at the Anduin, and then some of them moved north and settled in Ossiriand in eastern Beleriand, becoming known as the Laiquendi (green elves). The Silvan elves are probably Nandorin and thus are among the Eldar. When Elwe was entranced with Melian in Beleriand, the Teleri split again. Some ultimately went with Olwe to the West. 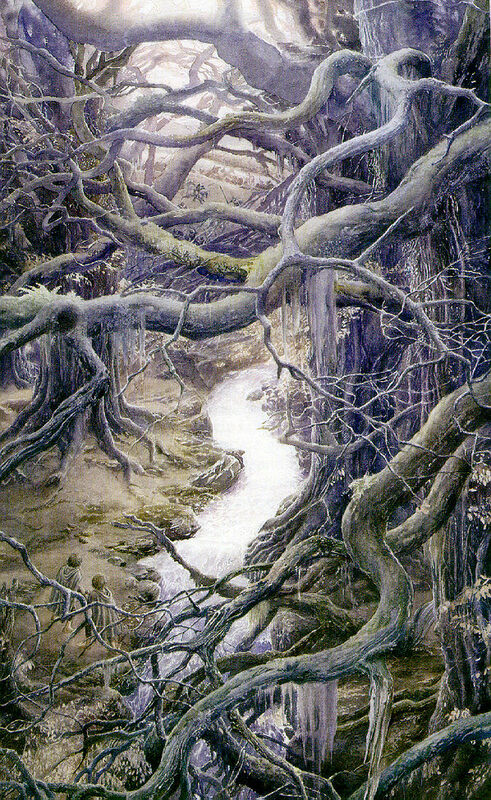 Those who remained called themselves the Eglath ("forsaken") and split again: those on the shore under Cirdan were the Falathrim ("beach elves"), and those in the woodlands and hills under Elwe were the Sindar ("grey elves"). Eldar who saw the light of the trees were Calaquendi. This includes all the Vanyar, probably all the Noldor, the Teleri who made it to Valinor, and of the Sindar, only Elwe. Technically all those remaining in Middle Earth would be Umanyar (not having gone to Aman). The Moriquendi "dark elves who had not seen the light of the trees" are the Avari and the Nandor (who did not have Melian's influence). The Sindar of Melian and Thingol would have been influenced by the might be considered between Calaquendi and Moriquendi, hence the reference to "twilight elves." The accompanying text provides more detail and seems accurate. When Oromë found the Elves that awakened in Cuiviénen, he summoned them to come with him to Valinor. All the Minyar and most of the Tatyar were persuaded, along with some of the Nelyar, and followed Oromë into the west on the Great Journey. The rest, who dwelt furthest from the waters of Cuiviénen, and wandered in the hills, had not seen Oromë at his first coming, and knew only vague scary rumors of the Valar; lies of Melkor concerning Oromë and Nahar perhaps had a role.So they remained suspicious, or simply refused to depart from their own lands, and spread gradually throughout the wide lands of Middle-earth. Their population was composed of half of the Tatyar and one third of the Nelyar, who maybe were called Lindai. According to a tradition their leaders were Morwë of the Tatyar and Nurwë of the Nelyar. They were after known by the name "the Unwilling", because they refused the summons. According to the legends, Orcs may be descended by Avarin elves captured and corrupted by Melkor. Initially the Avari stayed in Cuiviénen but many of them started to wander westwards. The Avari who finally went westwards, were mingled with the Nandor of the Vales of Anduin, Eriador and some reached Beleriand, mingling with the Laiquendi. But very few settled in Doriath. The Avari who came from the Tatyar were unfriendly and jealous to the Noldor, their exalted kin, and accused them for arrogance. The Edain who traveled to the West met the Avari first of all the Elves, and were taught from them music and language, which influenced theirs. They probably taught them many of the basic crafts of civilization, though the craft of the Eldar surpassed that of the Avari even more than that of the Avari surpassed primitive Men. It is told that no Avari Elves were to be found west of the Misty Mountains during the late Third Age. But it may be that they were so integrated with other factions and simply were not noted as such. J.R.R. Tolkien, Christopher Tolkien Morgoth's Ring, "Part Two. The Annals of Aman"
J.R.R. Tolkien, Christopher Tolkien Unfinished Tales, "The History of Galadriel and Celeborn", "Appendix A: The Silvan Elves and their Speech"